When was the last time you made S'mores with the kids? This past weekend my kids made S'mores over the grill with some of the kids from the neighborhood, because ALDI had sent us a S'mores kit. 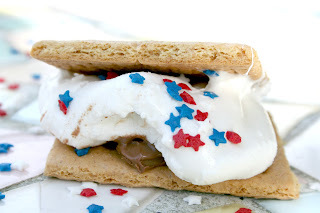 Did you know that you can make ALDI S'mores for less than $4? You can make your own frugal s'mores with affordable ingredients from ALDI. If you want to add a little sparkle to your s'mores, you can pick up the Baker's Corner Patriotic Sprinkle Jar for $2.99. Take a look at my kids' ALDI s'mores party here.